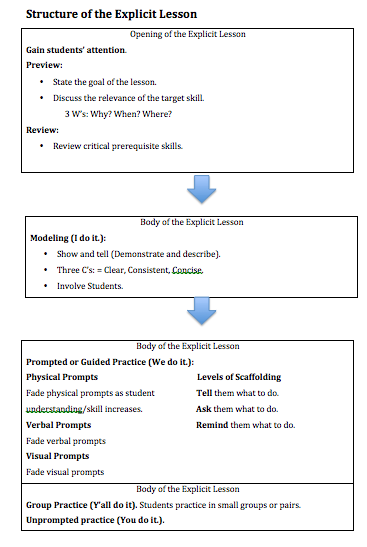 Definition: "Explicit instruction is characterized by a series of supports of scaffolds, whereby students are guided through the learning process with clear statements about the purpose and rationale for learning the new skills, clear explanations and demonstrations of the instructional target, and supported practice with feedback until independent mastery has been achieved" (Archer, 2011). The effectiveness of explicit instruction has been validated repeatedly by research involving general education and special education students. The effect sizes for the following explicit teaching methods are given: reciprocal teaching .74, feedback .72, student self-verbalization .67, frequent testing .46, direct instruction .59. These effect sizes tell us that significant student progress is made when these techniques are used. Begin lessons with a clear statement of the lesson goals and expectations. Review prior skills and knowledge before introducing new material. Provide immediate affirmative feedback and corrective feedback.